According to the University of Michigan Health System, papain dervies from unripe papaya fruits and can offer health benefits. Available mainly as a pill or powder supplement, papain can be found at most local drug stores and supermarkets. Papain is available to supplement-users without the need for a prescription or doctor recommendation. 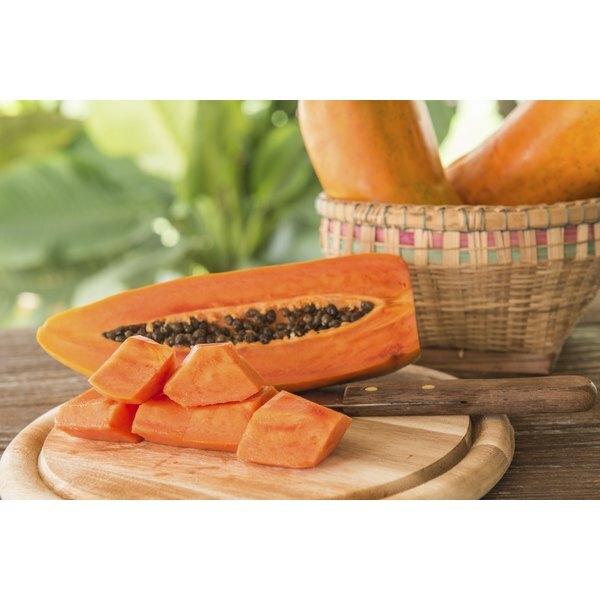 One of the major benefits of papain is for its digestive properties. This supplement contains ingredients that act as digestive enzymes when consumed, and become most active in the intestines and within the pancreas. According to the University of Michigan Health System website, papain behaves like other fruit-based digestive enzymes by breaking down food in the stomach; a process critical to proper digestion. Another common use of papain is for the treatment of various skin irritations and wounds. According to the University of Maryland Medical Center, papain has traditionally been used for the treatment of burns, bedsores, wounds from surgical procedures and skin ulcers. Papain lotions are best used on wounds already in the healing process and not on open sores. When applied to the skin, you should be careful as to not let the ointment come in direct contact with open wounds, according to the University. Papain as a skin treatment is best administered under the supervision of your medical doctor. Papain supplements may help with reduction of swelling or inflammation in the prostate gland. According to the University of Maryland Medical Center, papain in combination with alternative medications such as Quercetin has shown to be effective in helping the body produce anti-inflammatory agents that affect the prostate gland, thus reducing swelling and the onset of a condition referred to as prostatitis. Additional research must be conducted to determine the consistency of these claims.